The Sustainable Dairying: Workplace Action Plan outlines a path to achieving high quality work environments which are mutually rewarding to employers and employees. What is the Workplace Action Plan? The Sustainable Dairying: Workplace Action Plan is an industry action plan developed by DairyNZ and Federated Farmers to assist dairy farming businesses to adopt good workplace management practices. The plan describes what a quality work environment in the dairy industry might look like and sets out the coordinated actions and commitments of the industry. It also provides practical advice and support to employers and employees. Why do we need a Workplace Action Plan? The benefits of a quality workplace are considerable. Good work environments will help attract and keep the motivated and talented people we need in our industry. Good work environments are productive, rewarding, safe and enjoyable for all people on farm – employers and employees. Good work environments mean you can reap the rewards in the good times and help each other during the tough ones. DairyNZ and Federated Farmers are clear that it is people who will drive our dairy business success – economic, environmental and social. 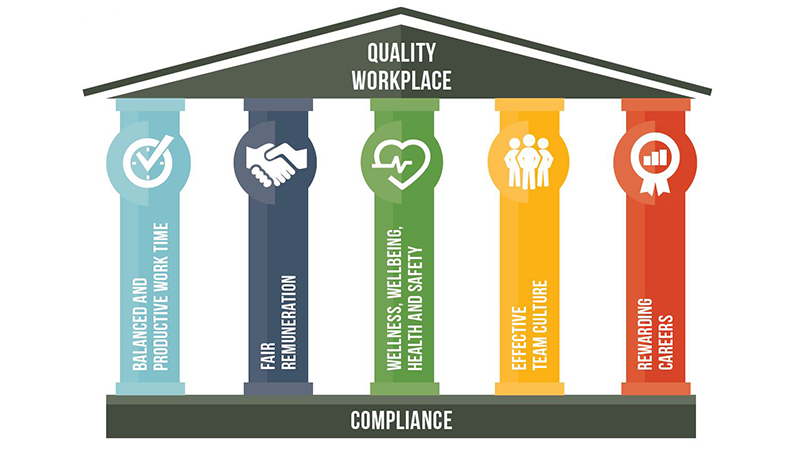 The Workplace Action Plan is built on five pillars of good people management. Farms first need to create workplaces with firm foundations by complying with the law. However, if you want people to stay, grow and contribute then you need quality work environments which motivate and reward people fairly. You need to do more than the basics. Developing a plan to improve your farms performance in the five pillars of good people management is a great start. How does the Workplace Action Plan help farmers? The primary aim of the Sustainable Dairying: Workplace Action Plan is to provide support to dairy farm businesses, and give them options to improve their ability to attract, motivate, develop and retain skilled employees. Who else supports this plan besides Federated Farmers and DairyNZ? A range of organisations have signed up as supporting partners of the plan including Massey and Lincoln Universities, Young Farmers and the Dairy Women’s Network. Does this involve new regulations to which farmers must comply? No. The Workplace Action Plan has been developed by DairyNZ and the dairy section of Federated Farmers to help farmers and employees. It does not create and apply any new regulations. The plan offers employers and employees voluntary activities they can undertake to support their businesses. It also clearly sets out legal requirements. What about that 50 hours recommendation, what does that mean? The plan says that staff who are working on a well-designed roster normally are not likely to work more than 50 hours a week; have regular days off (at least two consecutive days) and are not likely to work more than 10 hours a day. It also recognises that dairying has strong variations in seasonal work demands which sometimes call for long hours and exceptional effort. However, exceptional circumstances should not be embedded as the norm. It is a legal requirement that minimum wages or above have to be paid for all hours worked. Does that mean there are no standards that farmers have to comply with? No, there are already legal standards that farmers have to meet – these are clearly set out in the plan to make it easier for farmers to understand what those set regulations and legal standards are for employment and health and safety – and how to ensure their businesses comply and avoid any time-consuming problems. The Workplace Action Plan considers these legal standards are the foundations for good employment relationships. So why would a farmer go the extra steps of the Workplace Action Plan – from good to great? Sticking just to the legal standards is unlikely to create satisfying and productive work relationships and help farmers attract and retain skilled staff. It’s a competitive marketplace for good staff – and the options are global and growing for young people. What does the Workplace Action Plan expect the farmer to do? A recommended first step for farmers is to check the guidance captured in the five pillars of good employment practice, and evaluate whether they have gaps that they want to address. There are tools to help farmers do this – and our aim is to make it easy for them to take action if they want to and set out a road map for them to boost the performance of their businesses. Will this cost farmers’ money? Only some of the actions recommended have a cost associated with them, such as conducting the Good Practice HR Assessment Survey for farm personnel ($200 plus GST). Other follow-up actions such as involving a rural professional may also require investment. However, these investments and their timing are stepped and voluntary. There is also considerable room for adaptations and actions that have little or no cost. Behind all of the actions recommended is the proven return to businesses of good people management. Having a quality workplace will allow you and your team to focus on delivering great results for the farm and everybody in the team has a part to play. At the farm level, view these goals as areas you should focus on as a farmer to develop a quality workplace. All farming businesses are invited to become Friends of the Workplace Action Plan. This guide covers the five pillars of good practice that contribute towards creating a work environment where good people want to stay, grow and contribute.